This dish is easy enough to put together for any weeknight meal and presents beautifully for a get together with company. 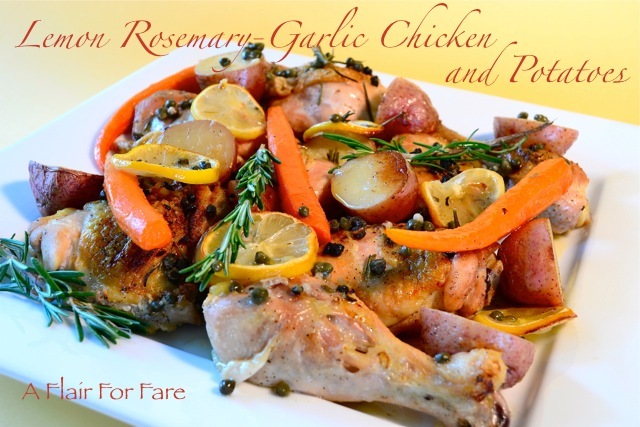 The lemony, garlic, rosemary sauce is a welcome accompaniment to the tender, succulent chicken and vegetables. I chose to add carrots to the original recipe as they go well with red potatoes and adds nice color to the presentation. Season chicken with salt and pepper. Cut potatoes in half or quarters if too large. Place a large roasting pan on the stovetop over 2 burners. Over medium high heat, add 3 tablespoons olive oil to pan. Place chicken skin side down in pan, add potatoes and carrots and cook until chicken starts to brown, 10-15 minutes. While the chicken cooks, make the sauce. In a medium bowl, mix the following ingredients. The original recipe calls for 10 cloves of garlic, you can cut that amount in half for a milder garlic flavor. Turn chicken over and cover in lemon sauce. 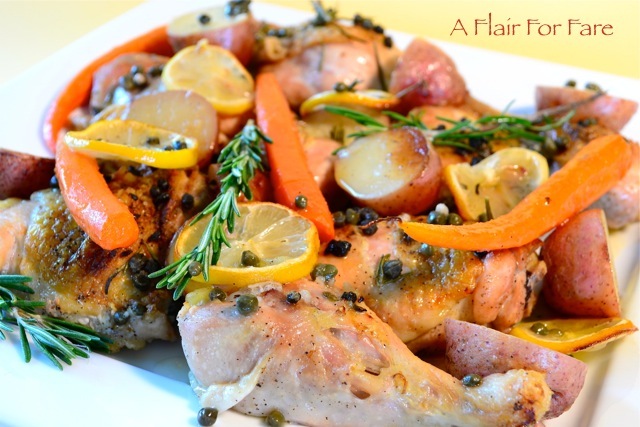 Bake for 50 minutes until chicken is done (165 degrees) and potatoes and carrots are tender. Spoon sauce over chicken and vegetables and serve.